Notice:Do NOT support any game device,such as PS3,PS4,Xbox Series. 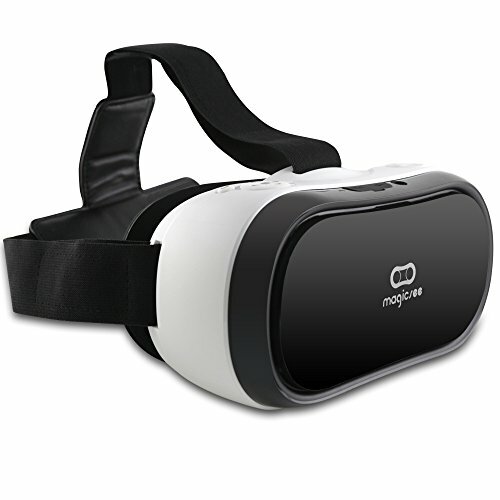 Virtual Reality World Becomes Reality:No cell phone or high end computer needed.Support pc synchronize the screen image to 3d glassss by HDMI cable,support 360 degrees viewing immersive experience, viewing angle more than 90 degree FOV,IPS 5.5 inches TFT SCREEN HD 1080*1920P pixels let you enjoy great virtual reality world! Automatic Focus,Comfortable and Adjustable Headband:High density comfortable sponge edges aroud face mask and adjust strips,your head and neck will not feel sore from having that weight pulling down on your face.Support under 0-600 degree myopia watching with naked eyes. 4000 mAH Rechargeable Li-polymer Battery:VR Headset with a 4000mAH batteries,can play about 2.5 hours.Hundreds of VR apps,you can download and install game and other normal applications from App Store and Google Play. NOTE: SCREEN RESOLUTION IS 1920*1080 3D split screen. Different VIDEO SOURCE' image may look BLURRY,it's nomal not defect! The vr headset designed with environmental material, make sure you have healthy and environmentally friendly experiences.Uses ABS and 42mm spherical resin lens material without stimulation plastic sheet, environmental. Offers you super 3D picture effect and wonderful feeling. Virtual Reality Headset, App Support: NIBIRU customized 2D/3D app, Google play, YouTube, Third party app etc. The media player supports videos of MP4, MKV, AVI, MOV, RMVB and other common video formats. Do NOT support any game device,such as PS3,PS4,Xbox Series. If you have any questions about this product by Magicsee, contact us by completing and submitting the form below. If you are looking for a specif part number, please include it with your message.